There’s still snow on the ground, but I’m dreaming of Summertime camping adventures. Have you started planning your next camping trip? Maybe you’re planning on buying your first camper and are weighing out the options in front of you. 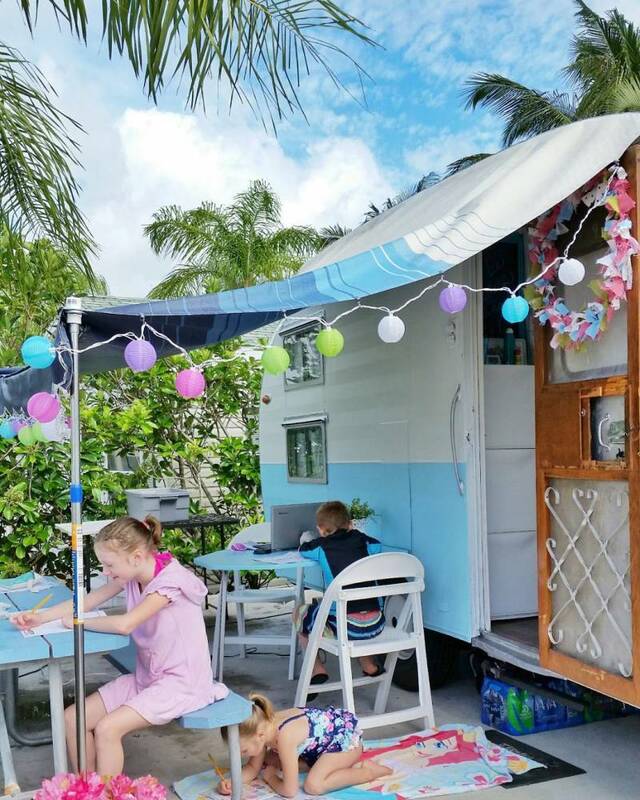 Have you always dreamed of owning an adorable vintage trailer? I dreamed of fixing up a vintage camper and that’s exactly what I did. We absolutely loved our time with our cute little 16 foot “canned ham” trailer. But, as our family grew, we decided to upgrade to something bigger. Now that we’ve experienced both, there are definitely pros and cons to vintage and new. There are still times that we lament about missing our vintage camper, while out with our bigger, newer trailer. Here are some of the pros and cons I could think of! Here are some of the vintage camper pros. The cuteness factor. This is probably one of the top pros for me. Everything about a vintage camper screams “Instagram me!” Cuteness and charm just ooze out of every corner. 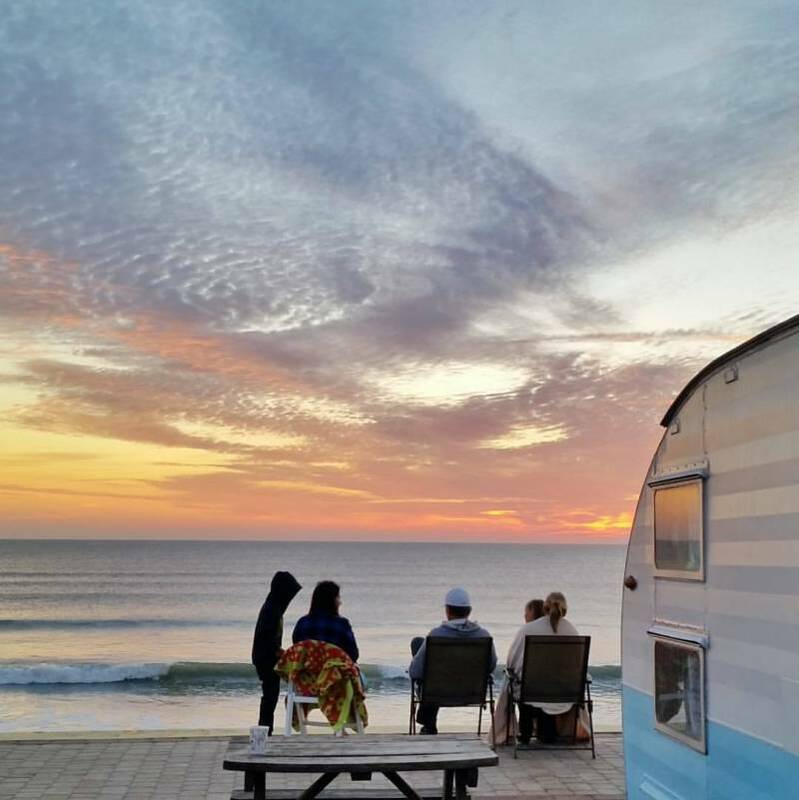 A vintage camper doesn’t have to be perfectly put together or flawless, to be adorable. It makes the perfect photo opp or background and looks great no matter where it’s parked. Be prepared for people to “ooo” and “ahhh” at every turn. Ease of tow-ability. I’m not even sure that’s a real word, but pulling a “canned ham” style camper is one of the easiest things to pull because of the small size. Our first vintage camper was 16 feet long and just over 2,000 pounds. Light enough for most mini vans to pull and so short you hardly know it’s there. Ease of backing in and setting up camp. Again, the small size of most vintage campers makes them a breeze to set up. If you don’t have much experience with towing or backing up a trailer, a small, vintage camper is the perfect place to start! Endless campground spot options. Since we have upgraded to a larger trailer, we’re realizing how good we had it with a 16 foot camper! With a small camper, you can literally fit anywhere! Once you start inching towards 30 feet, you are limited to what spots a campground will allow you to use. Less to Winterize. This is especially true if you have a vintage camper like ours that only had a sink with one hose running in for cold water. Since upgrading to a newer camper with multiple sinks, hot water heater, shower and toilet, we’ve spent hours trying to learn a whole new game. Winterizing is complicated and so is emptying a sewage line and visiting a dump station. It’s also pretty gross. The cozy memories. 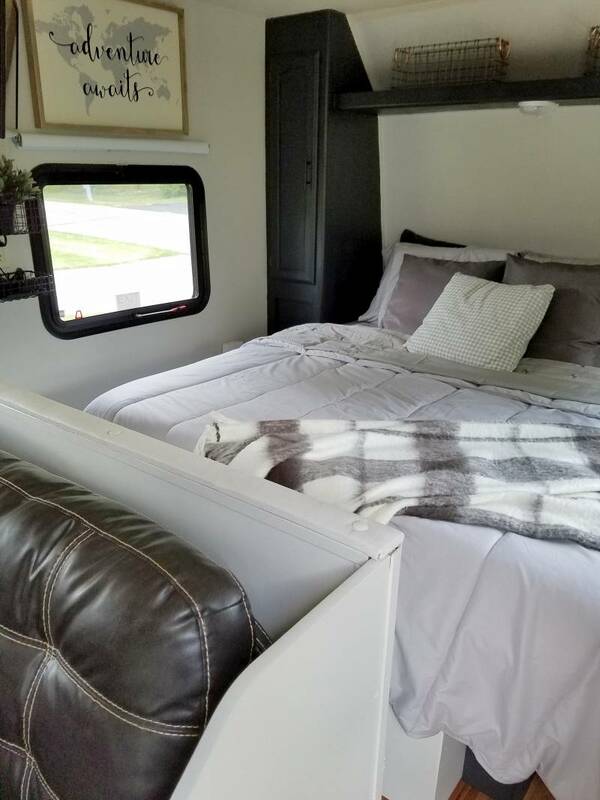 You might sleep a little tighter and be packed in a little closer, but the coziness can’t be beat. I lost track of how many older people stopped to share their own memories of camping with their family when they were young. 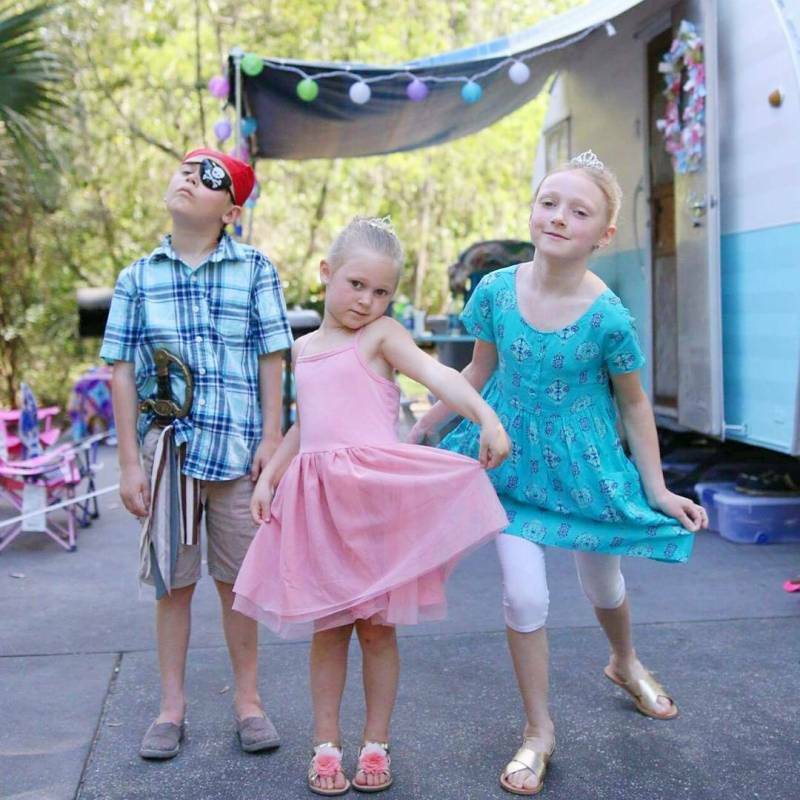 Many people shared stories of 6 or more kids packed into a 16 foot camper like ours. They still look back on those memories as the best time of their life. Here are some of the vintage camper cons. They are really old. Of course, the charm comes from being old, but so does some of the headache. Unless you have completely rebuilt one, stick by stick, there are old parts that will eventually wear down. Everything will need to be “babied” just a bit. What I mean by that is, you’ll probably want to keep it covered and watch for leaks, keep an eye on the frame, replace latches and knobs when they break, etc. Go prepared for anything and everything… duct tape is your friend. They lack modern conveniences. This could be viewed as part of the experience and a contributing factor to the charm, but some people will really struggle with this one. 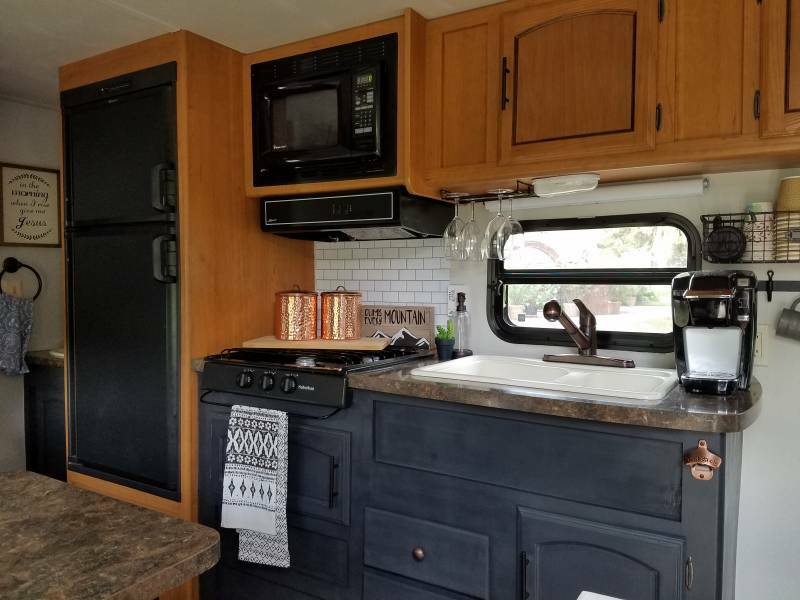 Yes, you can hook up a TV and electricity, but you probably won’t have all the fancy features that a newer camper has, like; power jacks, power awning, retractable awning, speakers, AC, shower, toilet, etc. Hard to find parts. Any original parts that break will be interesting to track down. There are a few vintage trailer website that sell original parts, or a local body shop may be able to replace them with a newer version. Improvising is key. Here are some of the modern trailer pros. All the parts are newer, up to code and easier to find when they break. Modern conveniences. Bathroom, water heater, speakers, power awnings, etc. More room. Of course it depends on what layout you end up with. The trailer we now have is roomier in general, but has less closet space than our vintage camper had! Here are some of the modern trailer cons. More parts means more things can go wrong. Just because it’s new, doesn’t mean things won’t break! Modern trailers are still known to have issues, broken parts and water damage. The issues is, with a modern trailer, things that break are generally more expensive to fix! Harder to pull and back-in. A larger trailer means more hassle to pull and harder to back up. A larger trailer may mean sway bars, weight distributing hitch, wheel locks, electric breaks, etc. It’s definitely more complicated. We never even considered the cost all those things would amount to when we purchased our 26 foot trailer! Fewer campsites to choose from. I never really considered how much more limited our campsite options would be with a larger trailer. I’ve found that many sites are good for trailers up to 25 feet, but ours is a 26! You are also more limited depending on what type of power connection you need. Not nearly as cute. There’s really just no way around this. 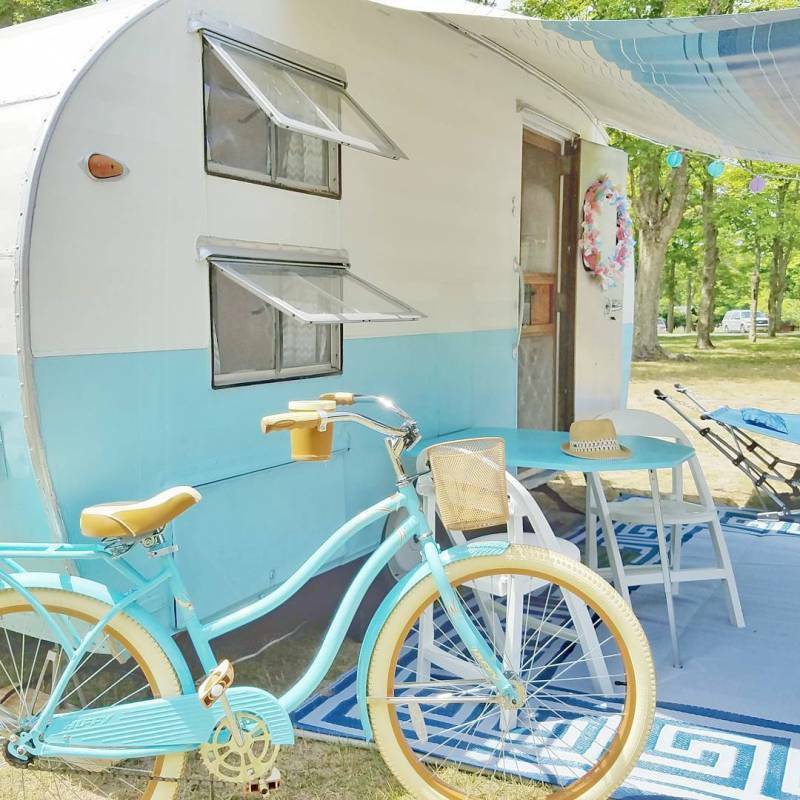 No matter what you do, there’s no competing with the cuteness of a vintage trailer. Winterizing hassle. This year was our first year to Winterize our new trailer. We googled and YouTubed a lot of options and asked a lot of opinions, only to completely forget about it. That’s right, we didn’t do anything with the water lines until it was too late. We remembered at Christmas time and had to wait until it warmed up enough to check on the damage. We ended up with one broken pipe and will have to wait until the Spring to find out what else may have gone bad. Sewage hassle. Like I said, learning about sewage lines, dump stations and holding tanks is a whole other language! We have had to learn so much, but there is no way around how gross it all is. But it’s a trade off. Modern conveniences = poop water dripping on your hands. Water damage fears. I’ve known quite a few new RV and trailer owners that have faced issues with leaky windows and roofs. It’s crazy that this is still something you have to worry about, but it just is. The smallest trickle of water over time, can cause crazy damage.